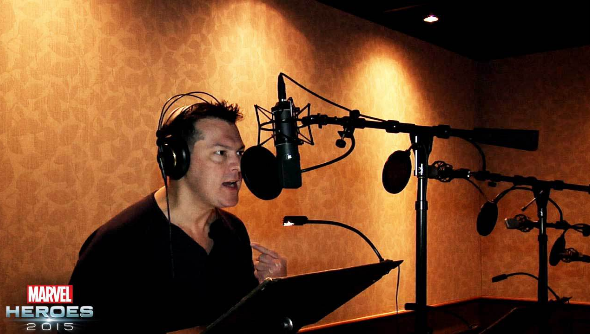 David Hayter is one of video gaming’s treasures. Best known as the voice behind Metal Gear Solid’s Snake, he’s also familiar to the ears of anyone who’s played Eternal Darkness, Star Wars: The Old Republic, and République. Lately he’s been joining Marvel’s cast of ever-growing actors to play a superhero, voicing The Winter Soldier in MMO Marvel Heroes. “When I saw this audition come through from Marvel, I couldn’t resist,” said Hayter. 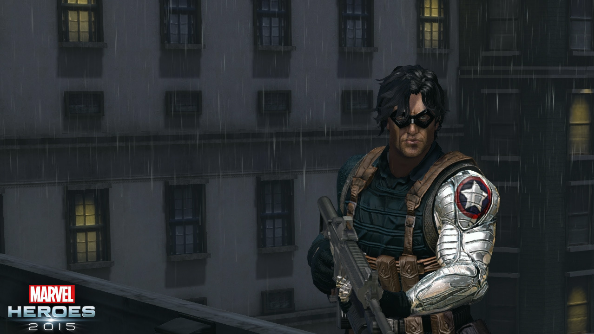 Playing The Winter Soldier is a bit of a hark back to Hayter’s earliest voice role, where he played Captain America in Spider-Man: The Animated Series. Despite coming from the same comic though, Cap and Winter Soldier couldn’t be more different. It was a role that would take a little more preparation, then. “I watched Captain America: The Winter Soldier for research on the Winter Soldier’s voice. Then I discovered that he barely talks at all in the film. So it didn’t help much,” said Hayter. Drastic measures were called for. “First thing was to cut off my arm. You just can’t do the Winter Soldier with two arms. After that, my preparation gets a little hazy,” he joked. Acting for video games is a very different world to that of film. “Sometimes your lines are recorded out of order, so you have to sort of feel your way through to the meaning of the dialogue,” explained Hayter. Sometimes actors get to work together, especially if it’s key that their relationship displays chemistry (think Booker and Elizabeth from BioShock Infinite). The most classic approach though is to record lines alone. This could be perceived as restrictive, but Hayter had no problems with it for Marvel Heroes. “Winter Soldier was fairly straightforward, but exceptional fun,” he said. It’s a strong point. Without Troy Baker’s performance as Booker in BioShock, would the relationship between him and Elizabeth have seemed as honest? Imagine the game with Resident Evil-grade vocals, and the impact of the story practically vanishes. Alongside voice acting, Hayter is also a Hollywood script writer, having penned the screenplays for X-Men, X-Men 2, and Watchmen. Despite being strongly tied to the games industry though, he’s never attempted to do a game-to-film adaptation. “Some games just don’t need to be movies, and I’ve turned down a few that didn’t,” he said. Why? “In a film, you have only two hours to immerse an audience – of gamers and non-gamers alike — into a world which a videogame player make take months to explore. I think this is the problem with trying to adapt something to film, from an already incredibly rich, visual medium,” he explained. Fancy a chance at picking up The Winter Soldier or another Marvel hero to play as in Marvel Heroes? We’ve got 5,000 hero keys to give away!